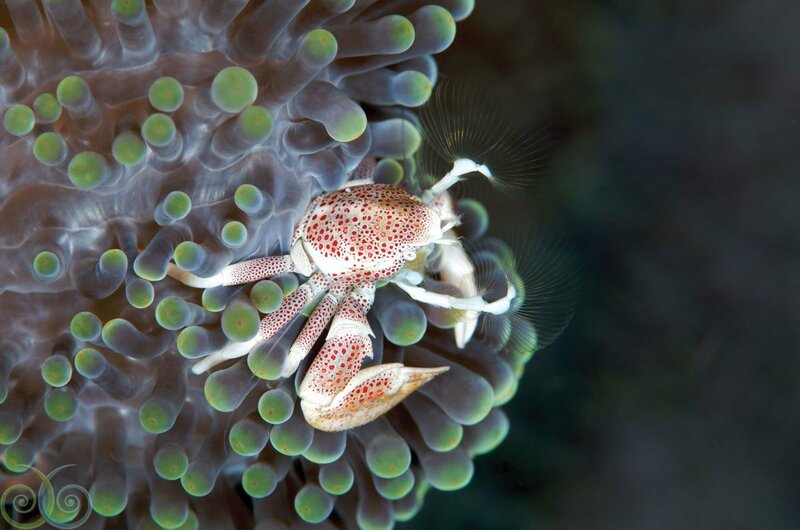 Our House Reef is a shore dive, easily accessed at any time from either the end of the jetty, the Dive Centre, or the steps leading down from your Water Cottage accommodation. On a rising tide, jump off the end of the jetty and enjoy an easy drift North through the channel, which is exposed to variable current. Schooling horse-eyed jacks congregate under the pier, joined by massive schools of fusiliers and shoals of passing anchovies. Several very large groupers make their home in the depths under the jetty, and they often appear to inspect visitors to their reef. We regularly see large black tip reef sharks patrolling the deeper areas, as well as the occasional grey reef shark. a small island in the Fiabacet chain, which looks an awful lot like a nudibranch from a distance. Just a quick 5-minute speed boat ride from the jetty, this site is a must for critter enthusiasts and macro photographers. True to its name, you'll find a wide range of flamboyant nudibranchs lurking among the abundant soft corals. 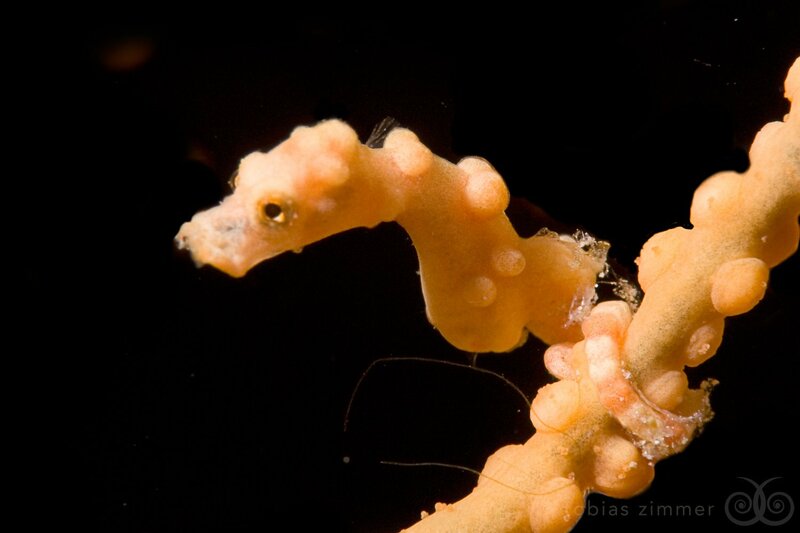 The sea fans are well populated with pygmy seahorses and cowries. Be sure to inspect the abundant crinoids for their colour-coordinated arrowhead shrimp and cling fish. When currents allow, this site is also popular for its pinnacles crowded with larger pelagics like Barracuda, Big Eyed Travelly, and the odd mature Grey Reef Shark. The sloping shallows of Nudi Rock are stunning for wide angle shots with exquisite colours and hard coral gardens. 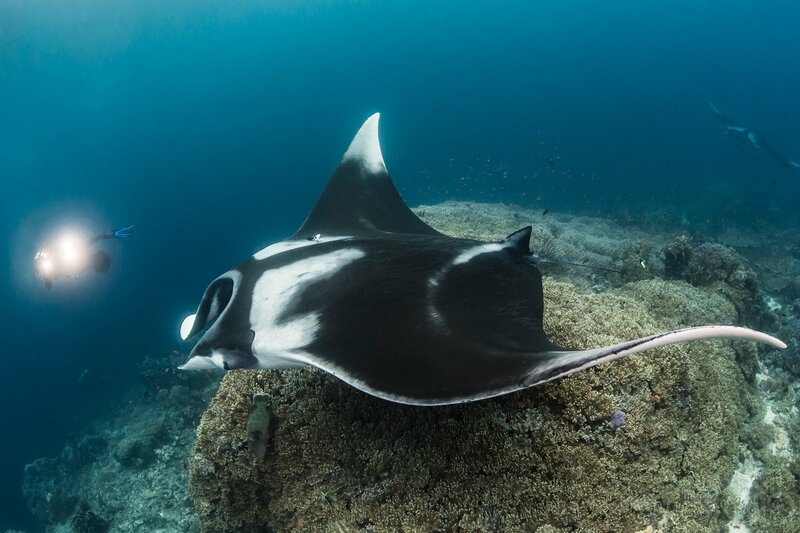 This sea mount is located about 20 minutes from the resort, and is a busy Manta ray cleaning station. The submerged pinnacle reaches up to about 7 meters, and you have a very good chance of seeing not one by TWO species of manta rays here - both the giant Oceanic birostris as well as the smaller reef manta, alfredi. 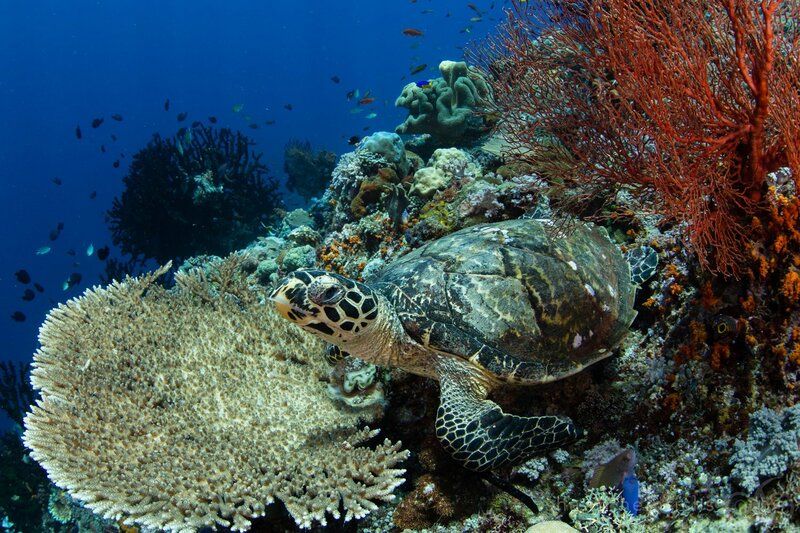 Magic Mountain is also a nursery for White Tip Reef Sharks and a love nest for Napoleon Wrasse. Because this site is completely exposed to oceanic currents, you can expect to see large schools of pelagics in the blue. The huge island of Yillet stretches east to west about 15 minutes north of our resort island. 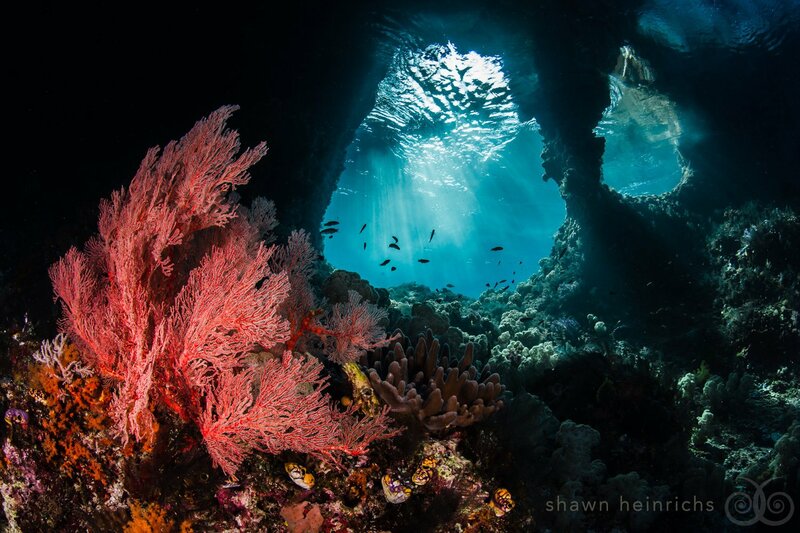 This island used to be home to an itinerant shark finning camp, and we are pleased by the stunning resurgence of life on its surrounding reefs, including sharks. One of Yillet's tiny satellite islands is particularly rich and topographically weird. The tiny island has been undercut by untold millenia of wave action, forming an umbrella over a sloping underwater plateau with numerous spooky overhangs and cavelets. Diving with a torch is highly recommended for this site - you'll want to illuminate the dark corners of this site to see all the critters, as well as the wild colours. Barramundi cod and Hawksbill Turtles frequent this site. We also suggest you keep a sharp eye on the blue, as huge schools of barracuda hover in formation. One of our most famous dive sites, named for its unique topography. The site is a small island about 15 minutes from the resort, with 2 swim-through 'windows' carved into it. The South West face of this site is quite steep and exposed to current, so you are likely to see patrolling sharks as well as the elusive Wobbegong Shark - be sure to look under the massive table corals! When the currents are right, we'll move off towards a large pinnacle in the blue. The pinnacle is often surrounded by pulsating schools of fusiliers and gangs of plate-sized Batfish. Heading back towards the Windows, notice how the sunlight filters through - it's like nothing else on earth! We'll follow the plateau of hard plate corals and look for Sweetlips hiding underneath. Be sure to investigate the huge Barrel Sponges - their crevices often conceal Hairy Squat Lobsters.